Chicken liver is one of the most useful byproducts. It is abundantly found weight necessary for proper development and growth of the child's body elements. These are vitamins B6, B12, C, sodium, calcium, copper, zinc, iron, folic acid. 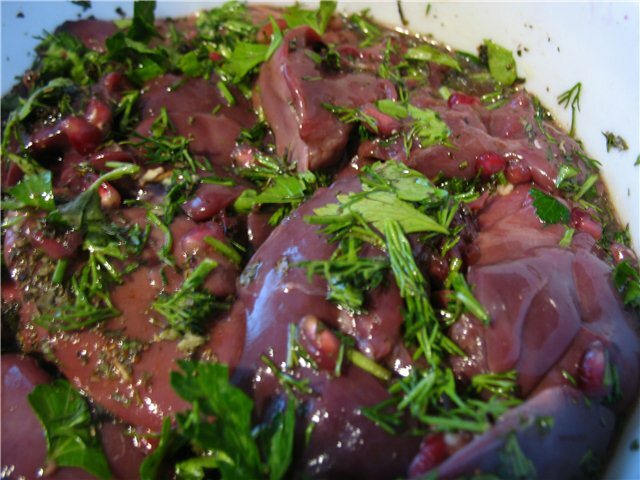 The recipes, from which you can learn how to cook chicken liver for children, is quite diverse. Regardless of what recipe to prepare chicken liver for a child, it should be thoroughly rinsed. Sometimes when cutting chicken in the industrial production in the liver and other internal organs come in contact with the spilled bile, getting her bitterness. One such piece can ruin the taste of the entire dish. The most traditional option is a liver, stewed with vegetables in sour cream. For its preparation of chicken liver washed cleaned of excess film that is cut into small pieces. Carrots and onions cut into cubes. Liver is fried in oil together with vegetables, then add sour cream. Salt and spices are added to the dish in taste, but for children up to three years it is advisable not to abuse them. On medium heat dish cooked until done, which is enough for 30 minutes. To vary the recipe, increasing the range of vegetables. With carrots and onions goes well with bell pepper, green peas, corn, green beans. Experimenting in this way, the taste will be new every time. Thanks to the sour cream like chicken liver for kids turns out very gentle and suitable for power after the second year of life. If such meat product the child doesn't like, you can cook the chicken pate. This hearty and nutritious dish for Breakfast suitable for other family members. For him the liver fry until cooked on medium heat, then scrolled through a meat grinder together with the chicken egg yolks and butter. Also you can add boiled carrots, which will make the paste even more beneficial. The mixture should acquire a smooth consistency. Can only shift it into a container and refrigerate. When serving a sandwich with this paste can be decorated with greenery.